Easter Sunday was a bit low-key for us this year. I had a wedding to shoot on Saturday so we couldn’t go out of town to be with family and we didn’t have time to prepare the feast we normally do. We typically like to have brunch-type foods when we know it’s going to be just us because breakfast is usually easy to throw together in less than an hour after church and, well, who doesn’t like breakfast for lunch?! A few months ago I ran across a wonderful yeast waffle recipe that you mix up the night before and let it sit out on your counter to get all bubbly. Sounds strange, but it imparts such an amazing sourdough, yeasty flavor to the waffles which helps balance the pure sugar you typically use to drown the waffle. 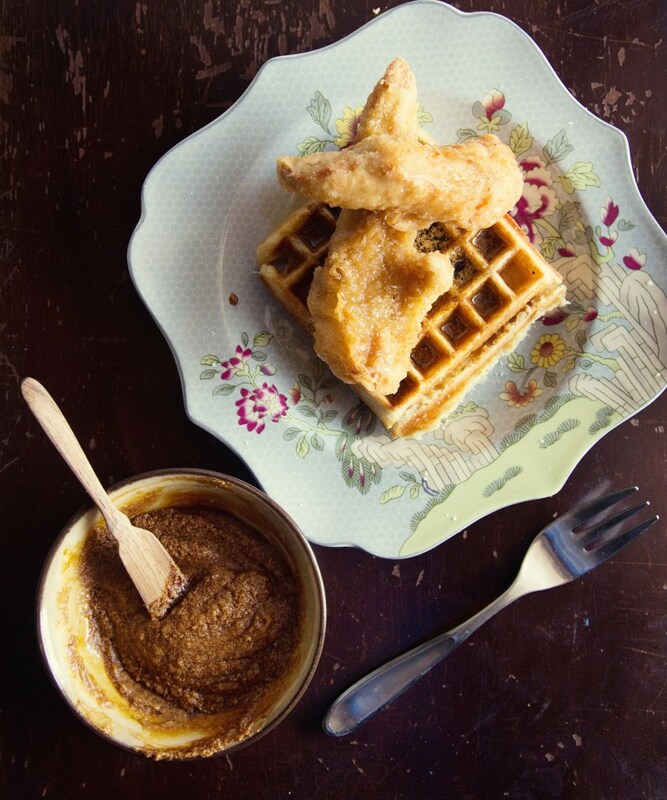 Matt and I have had a slight obsession with the Southern dish of chicken and waffles and every where we go where it’s on the menu, we always feel the dish falls a little short of the expectations in our mind. The chicken should be juicy, super crispy, salty and flavorful on its own and the waffle shouldn’t be too heavy – it should be light, airy and buttery with just enough sweetness to give that perfect balance of flavors. 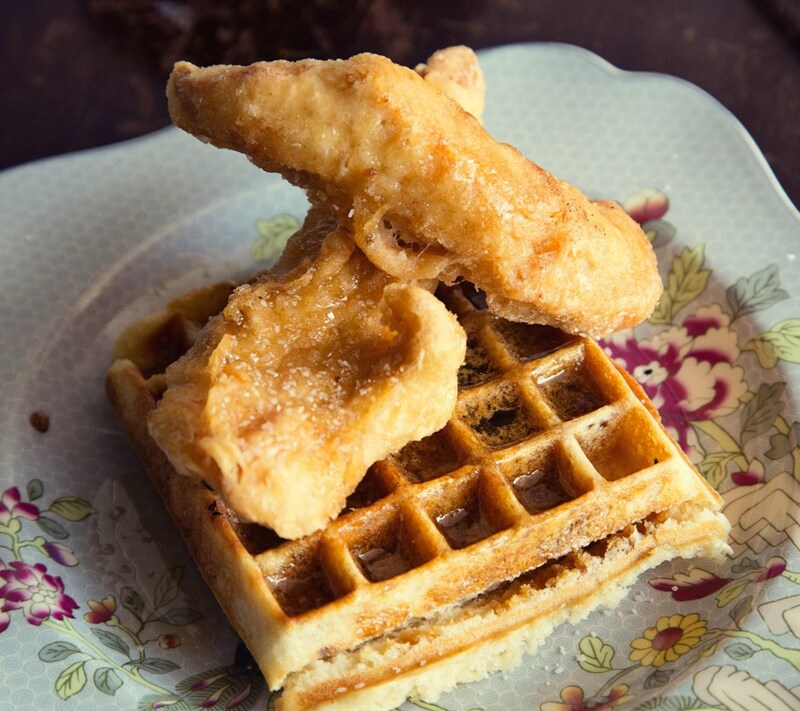 A lot of waffles are too heavy, too bland, too sweet or the chicken is an after-thought – dry or not seasoned. So, taking matters into our own hands, we used the amazing recipe for Korean fried chicken that we did at the Super Bowl and paired it with a yeast waffle recipe and the combination was juuuuuust right. I added my own sentimental flair to the dish. 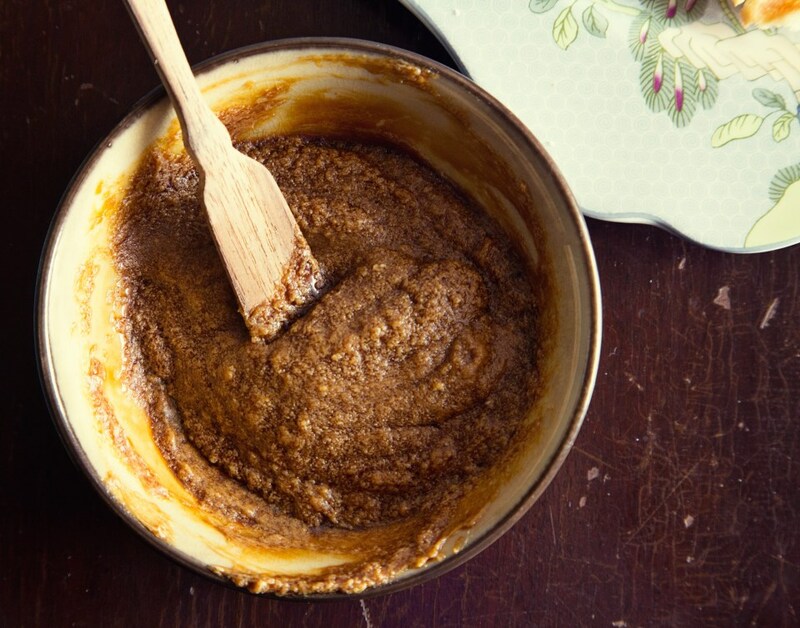 Growing up, I distinctly remember at family gatherings, often at Sunday lunches, my Pappaw would request molasses and then he’d take a large chunk of soft butter and whip the two together into a smooth paste for his biscuits. I thought it was odd, but as far back as I can remember, there has never been a food strange enough that I wouldn’t try it. I immediately began to imitate his method and loved the tangy sweetness of the molasses butter on my biscuits, too. Combine 2 teaspoons kosher salt, 1/4 cup cornstarch, and 1/2 teaspoon baking powder in a large bowl and whisk until homogeneous. Add chicken strips and toss until every surface is coated. Transfer chicken to a wire rack set in a rimmed baking sheet, shaking vigorously as you go to get rid if excess coating. Transfer to refrigerator and let rest, uncovered, for at least 15 minutes and up to overnight. Combine remaining 1/2 cup cornstarch, 1/2 teaspoon baking powder, flour, and 2 teaspoons kosher salt in a large bowl and whisk until homogeneous. Add water and vodka and whisk until a smooth batter is formed, adding up to 2 tablespoons additional water if batter is too thick. It should have the consistency of thin paint and fall off of the whisk in thin ribbons that instantly disappear as they hit the surface of the batter in the bowl. Add half of the chicken strips to the batter. Working one at a time, lift one strip and allow excess batter to drip off, using your finger to get rid of any large pockets or slicks of batter. Carefully lower chicken into hot oil. Repeat with remaining strips in the first batch. Fry, using a metal spider or slotted spatula to rotate and agitate strips as they cook until evenly golden brown and crisp all over, about 8 minutes. Transfer to a paper towel-lined plate and season immediately with kosher salt. Keep warm in a 175F oven while you fry the remaining chicken. In a large bowl, combine the milk, 1/2 cup melted butter, flour, yeast, eggs, agave and salt and whisk until smooth. Cover with plastic wrap and let stand until the batter is very puffy, about 2 hours at room temperature (or refrigerate overnight, which is what we did since we wouldn’t be using it first thing in the morning). Cook the waffles until golden crisp. Keep the waffles directly on your oven racks to keep warm and crispy until you’re done cooking them. I find that using a traditional sized waffle iron works best than a Belgian waffle maker because sometimes the Belgian waffle irons are too deep for the batter to rise into every crevice. Also, from the two different yeast waffle recipes we’ve tried, I prefer cooking them from room temp if you leave the batter out on your counter, as opposed to keeping it in the fridge. The batter seems lighter at room temp than cold, so you may want to test that out for yourself. Both are delicious, but I felt the batter at room temp was thinner and more of that super crisp, light texture I wanted. *from Food and Wine magazine but I think I prefer the recipe from Smitten Kitchen better. They’re almost the same, but she uses a little less flour. Use equal parts butter and molasses and whip together until completely mixed. Spread on waffles before topping with chicken strips. I added a drizzle of maple syrup on the chicken and then salted it to make the salt stick better. This entry was posted in Breakfast, Butter, Cravings, Easter Weekend, Eggs are Awesome, Food Memories, Uncategorized, Weekend Fare and tagged breakfast recipes, brunch recipes, chicken and waffles, Easter recipes, fried chicken, korean fried chicken, molasses, molasses butter, yeast waffles. Bookmark the permalink. This sounds so good! What can I substitute for the vodka? Or, can I just leave it out? I read that you can substitute white vinegar for the vodka, but we haven’t tried it. It’s necessary to keep gluten from forming in the flour and thus making the chicken not as crispy.